I'm back again with another interesting Etisalat 1GB free browsing cheat. This cheat is working fine as at the time of this publication, and it's not hard to activate on your Etisalat sim. Though, the cheat has been out for days now, but i always want to confirm and test the cheat before posting, so to avoid bad comments from you guys. Now, i can tell you that the cheat is tested and confirmed. Etisalat 1GB free browsing cheat can be activated by tweaking an IMEI number. You just have to be fast now that it's still new and blazing. I will be dropping the exact IMEI i used to activate my own 1GB data. That's what I'm presently using to write this post now. I only tweaked for like 5times before i was successfully activated. Without much talks, let's dive in to the main cheat. ==> First of all, tweak this imei to your Android phone: 359838075475087. Make sure you change the last 5 digits to any number you like, and also, do not use IMEI Analyzer to confirm if the imei you have chosen is correct. (I have my reasons for saying this). Are you new to changing IMEI? Kindly see this guide Here. You will get a response saying "Your request is been processed. Please wait for a confirmation message". You will only get that message if your IMEI hasn't been used by another person. Yes! you can accumulate and get more than 1gb by repeating the steps above. Tweak your IMEI and dial that code above. That's all. CAN I USE IT ON PC AND OTHER DEVICES? Interestingly, the data can be used on any internet enabled devices, be it Android, Java, Symbian, iOS and even PC via Universal modem. As seen in the message, the data is valid for 30days - 1Month. I'm flexing mine now. I hope you join me soon. If you are confused or have any problem, kindly use the comment box below and i will reply you ASAP. Etisalat free 1GB data IMEI Tweaking. 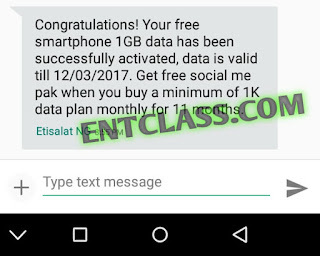 Latest 2017 Etisalat free 1GB data IMEI Tweaking. 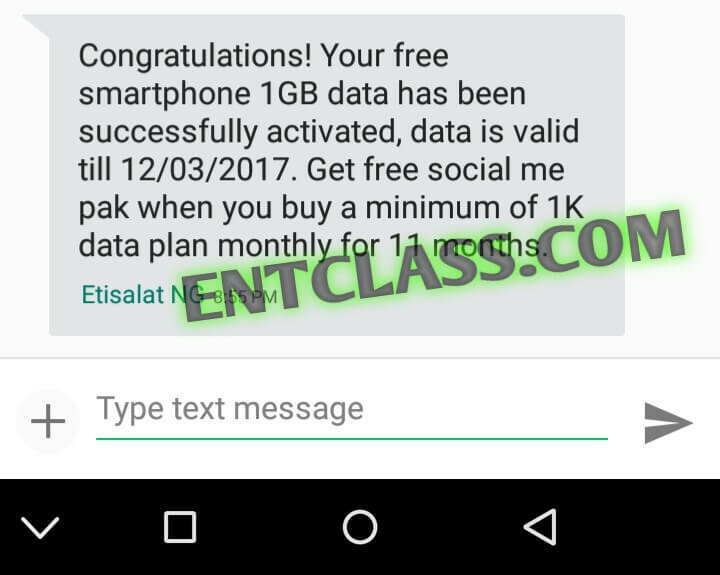 Etisalat free 1GB IMEI Tweaking 2017. Lemme go dust my Etisalat sim. it's time for free browsing. How do I know the IMEI is then correct. Without confirming it on a analyzer? I know the reason why i said so. Anyway, you can go ahead to confirm with IMEI analyzer. Yea. It won't. But make sure you write out your original IMEI down somewhere. It's simple. Kindly leave a space between + and E. You are good to go. I keep getting "imei has already been used" & "Your device is not eligible for this offer"
You will get a congratulations message. i have tweaked and tweaked and tweaked but no good result....always "this imei has been used by somebody" or "you device is not eligible"
There are many guys out there that have used so many IMEIs and even accumulated more. You just have to keep trying. You might be surprised to get an IMEI that hasn't been used. You don't have to reboot. Just activate and deactivate Airplane mode. Did you get a response like mSent Command. Something like that? Does it work on windows phone ? Tweak it on Android phone and use the SIM on your Windows phone. That's all. To accumulate it, keep tweaking the IMEI and sending that code. Please since Friday Glo redirect.glo.com tweak has been extremely slow. Please can anyone check if this is a general issue? Yea. It's a general issue. You ain't alone. Bro can u get anoda 1gb on dat same sim after exhausting d previous one? Yes. You just have to keep tweaking and sending that code. We are really sorry about that. iPhone can't be compared to Android device when it comes to tweaking and free browsing cheats. That's the edge Android has over iPhone. We do write about iPhone but not about tweaking or using it for free browsing cheat. You really need an Android phone to support that iPhone you have. Thanks for stopping by. I tried everything it's still not working it said msent and etisalat said I am not eligible for it. You got the IMEI tweaking but the IMEI you chose has been used. You gats to keep tweaking man. Wow. Let me give it a try. It does. You just have to start keep tweaking IMEI. But now, almost all the imeis has been used. Just try your luck. You came very late. Most of the imei has been used. Getting a working IMEI will be very hard. I just shared the steps above. Kindly follow my above instructions.